Kelly Ayotte’s bad week just got a whole lot worse. 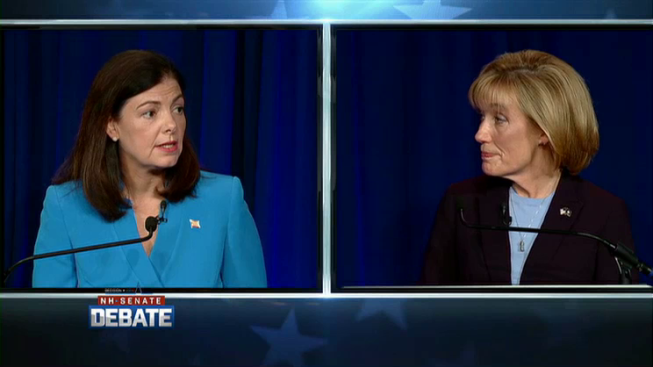 Ayotte’s opponent in the hotly-contested Senate race – Democratic Gov. Maggie Hassan – seized on the comment, putting out a new TV ad showing Ayotte’s “absolutely” statement followed by clips of Trump insulting people. Now, as news breaks about a 2005 conversation Trump had in which he made numerous misogynistic comments about women, Ayotte is facing another round of criticism. Hassan and other New Hampshire Democrats are now calling on Ayotte to not only distance herself from Trump, but to say she won't vote for him, as some other Republicans have already done. Ayotte said Friday that Trump’s comments are “totally inappropriate and offensive.” A New York Times story says she is facing “immense pressure” from other Republicans to disavow Trump and is said to be considering it. But Hassan, who called Trump’s comments “vile” and “beyond comprehension,” said denouncing Trump now would be too little, too late. Ayotte attended a high school football game in southern New Hampshire on Friday night, but it wasn’t immediately known if she had any other public appearances this weekend. Some New Hampshire Republicans are already joining national GOP figures like Paul Ryan and Mitt Romney in condemning Trump’s remarks. “Vile and vulgar comments against women should never be tolerated,” the New Hampshire College Republicans said on Twitter. “Nor do they reflect the values of the NHGOP,” added Jennifer Horn, president of the New Hampshire Republican State Committee. Joseph Sweeney, a Republican state representative and chairman of the New Hampshire Young Republicans, said this latest revelation about Trump has pushed him over the edge. He said he tried to move on from the issues he had with Trump, and even said recently that he was excited to support the Republican nominee in November. But all that has changed now. Other New Hampshire Republicans, though, are still standing with Trump. Al Baldasaro, a fervent Trump supporter who has traveled to many states to attend the candidate’s events, acknowledged in a tweet Saturday morning that Trump “isn’t perfect,” but said the candidate apologized for his locker room talk.